Banks and credit unions may have ironed many of the initial kinks out of their digital banking experience, but when consumers attempt more complex transactions, there’s still a big disconnect. In today's omnichannel world, traditional banking providers must stay laser focused on digital CX, or consumers say they will switch. The majority of today’s banking consumers have made the move to digital channels, but that doesn’t necessarily mean they are happy about it. Banks and credit unions continue to fall short of consumer expectations, particularly when it comes to more complex transactions, payments and areas involving personal financial management. According to a study fielded by Oracle, these shortcomings leave one-third of consumers open to trying a non-bank provider to get what they want. Traditional financial institutions had better figure out how to satisfy consumers in digital channels quickly, because their patience is wearing thin. In their research, Oracle asked more than 5,000 consumers about their banking preferences and expectations, segmenting responses into five areas: account opening, payments and transfers, personal and lifestyle loans, home loans and mortgages and personal financial management. Findings in their final report shows that today’s banking experience needs to be better integrated into people’s digital lives, providing service that is instant, integrated with social platforms, and — most importantly — driven by data. 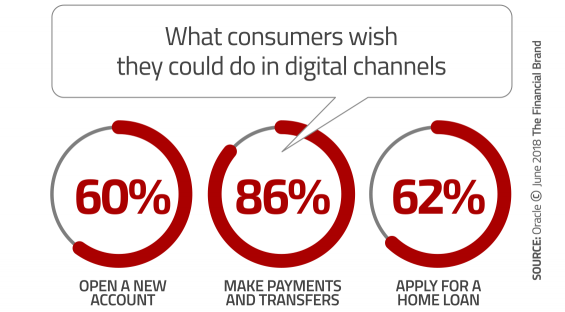 69% of consumers want their entire financial lifecycle on digital channels. In the study, four out of five respondents said they engage with their financial institution via digital channels at least some of the time, and two-thirds report that they are active online- and mobile bankers. However, 69% of those surveyed said they would like the ability to digitally engage with their bank or credit union for all their financial needs — not just some things, some of the time. There’s a fair number of consumers who are already engaging with fintechs and digital-only players in the financial space, especially when it comes to digital wallets, mobile payments, personal finance and wealth management apps. In Oracle’s research, more than half of consumers ages 20 to 36 said they already use a digital wallet or mobile payment platform provided by a fintech or challenger bank-provided. That might not be all that shocking, but what should scare traditional banks and credit unions is the number of consumers who are interested in trying out alternative banking providers and other similar new options. The danger of course is that consumers will try these products that are likely more innovative and offer a better consumer experience and never go back. And then migrate more and more of their financial life over to fintechs and challenger banks. “Banks have clearly not been able to keep up with consumer expectations,” says Devie Mohan, a fintech market strategist. “Consumers love digital channels, they just need to be driven there — either by an integrated offering or by a strong marketing channel. 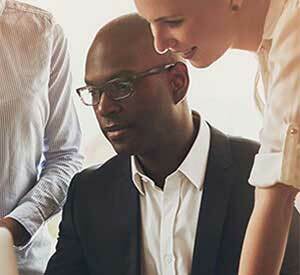 Oracle says that for traditional retail banking providers, the time for change is now. 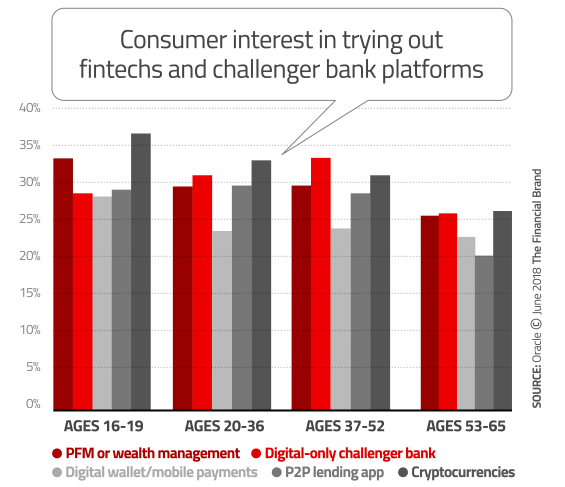 “Challenger banks have never been more compelling for digital consumers, and they are increasingly becoming a popular choice for almost all kinds of banking service, at every stage of the financial lifecycle,” they said in their report. According to Brett King, Founder and Chairman of Moven and author of Bank 4.0, the fastest growing financial services organizations in the world today are, technology-based providers, not incumbent banks or institutions — challenger brands like Alipay and WeChat in China, M-Pesa in Kenya, Paytm in India, Kakao in Korea, and more. The findings in Oracle’s report suggest consumers are restless and growing impatient. When Oracle examined the consumer financial lifecycle, they found that satisfaction scores plunge at critical life moments further down into the stages, with the biggest drops occurring with more complex financial transactions. “Currently, satisfaction levels are falling for all kinds of banking transactions, and the rise of new digital options has caused many consumers to see banks as a decreasingly relevant part of their digital lives,” wrote Oracle in their report. What explains these sinking satisfaction scores? Simple: friction in the digital experience. This is why Brett King says the banking industry now all boils down to the type of digital experiences financial institutions deliver. If banks and credit unions hope to deliver what consumers want when and where they need it — in digital channels and in real-time — King says it will require cultural shifts starting at the very top. Oracle says some banks and credit unions are still thinking about and discussing the digital transformation as something that’s “currently happening” or “will happen” in the future. Reality Check: If you’re still debating your digital transformation journey, you’re too late. Data will play a critical role in that transformation, helping banks use the information gathered through basic digital services to better understand their consumer, proactively anticipate future needs and build relevance at every stage of the financial lifecycle. According to Charlotte Petris, co-founder and CEO of Timelio, fintechs wouldn’t have been able to disrupt the banking industry the way they have if traditional institutions did a better job in digital channels.